The war was over and Walt Disney finally had his studio back. However, it was still not financially possible to return to the grandeur of the earliest animated features. Live action films were cheaper, quicker to produce, and could have a higher profit margin. Having just wowed audiences with realistically blending live actors in an animated environment in The Three Caballeros, Walt Disney decided that his next picture should be a mix of live action and animation. And for his source material, he went to his favorite childhood book, Uncle Remus by Joel Chandler Harris. Walt had acquired the rights to the Brer Rabbit stories in 1939, but had waited until he could adequately adapt them to the silver screen. Before filming began, Walt Disney had the script sent around both inside and outside the studio. He wanted to ensure that the film was as racially and culturally sensitive as possible as to not offend any viewers. The script was sent to nearly every official at the NAACP for comment and suggestion. Live action filming began in 1944. Bobby Driscoll and Luana Patten, two of the film's child stars, were the first actors ever signed to a contract at Disney. James Baskett was cast as Uncle Remus, as well as several animated character voices. Walt was so impressed with Baskett that he later claimed him to be the finest actor he ever worked with. Walt negotiated with the Academy to get Baskett an honorary Oscar for his role. The plantation scenes were shot in Phoenix, AZ, and the interior scenes were shot at MGM. The film is broken up into three parts. In the beginning, little Johnny's parents bring him to his grandmother's plantation. When his dad leaves him and his mother there and goes back to work, Johnny attempts to run away. He runs into Uncle Remus who pretends to help him run away, but intends to change his mind with a story about the time Brer Rabbit ran away and got in trouble with Brer Fox and Brer Bear. The story convinces Johnny to stay. In the second part, Johnny makes friends with Ginny, a girl with two mean brothers. She gives him a dog that he isn't allowed to keep, so he gives it to Uncle Remus. He tells Johnny a story of when Brer Rabbit got caught in Brer Fox's tar baby and how he outsmarted him with reverse psychology. Johnny uses the same principle to get the boys in trouble with their mom, but when the boy tell Johnny's mom she asks Uncle Remus not to tell Johnny any more stories. In the third part, Johnny is having a birthday party and he invites Ginny, but her brothers ruin her hair and her dress, causing Johnny to get in a fight with the boys. Johnny tells Ginny a Brer Rabbit story to cheer her up, but it doesn't work. When Uncle Remus overhears, he breaks his promise to Johnny's mom by telling them the story of when Brer Rabbit outsmarted Brer Fox and Brer Bear by taking them to his "laughing place." Johnny and Ginny go out in search of their laughing place and they bump into Johnny's mother. When she finds out that Uncle Remus told them a story and caused Johnny to miss his party, she tells him to stay away from Johnny. This causes Uncle Remus to decide to leave. Johnny realizes that his laughing place is with Uncle Remus and as he rushes to tell him, he finds that he has left. Johnny runs after him and accidentally enters a bull pen and is charged by the bull. Johnny's dad returns, having bumped into Uncle Remus and convinced him to come back. Johnny wakes up and has his dad and Uncle Remus back. The film ends with Johnny, Ginny, and Toby skipping around singing a reprise of "Zip-A-Dee-Doo-Dah" as characters from Uncle Remus' stories join them. Uncle Remus catches up as they all run into the sunset. 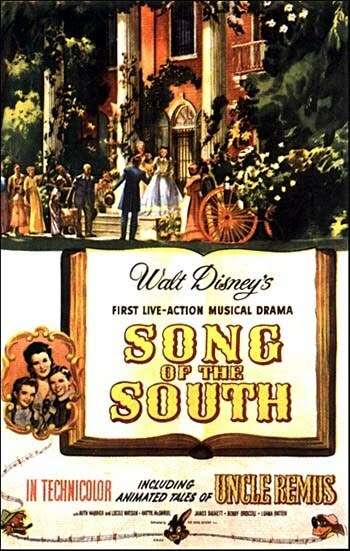 Song of the South premiered in Atlanta, GA, on November 12, 1946. The film was a success, earning $3.3 million at the box office at a time when the studio desperately needed money. Critics were split in their reviews. Half sang it's praises and heralded it as a return to the great Disney films of the pre-war era. Others couldn't get over the fact that the king of animation had produced a mostly live action film and bashed it. Critics couldn't wrap their heads around the fact that Walt Disney had entered the live action film business. The success of Song of the South convinced Walt to make another live action/animated combination film starring Bobby Driscoll and Luana Patten a few years later called So Dear to My Heart. Walt Disney had taken precautionary steps to avoid offending audiences. The 1940's American view towards African Americans was split between those that loved them and those that hated them, but the film was made to appeal to those that loved them. While there wasn't a huge outcry when the film was released, the NAACP, after praising the film for its artistic merit, claimed that it presented an "idyllic master-slave relationship." However, the film takes place after the civil war, so all of the plantation workers in the film are free, not slaves. But it is understandable why the film is seen as offensive. Nowadays no studio would dare to set a family film on a Southern plantation, but it was perfectly acceptable in the 40s. Disney re-released Song of the South several times in theaters, the last time was in 1986. With each re-release, the film gained more and more controversy and ultimately Disney executives made a decision to stop releasing it. To this day, it has never been available on home video in the U.S. It's not so much because of the content, but because the film appeals to children and could give them the wrong idea, although my personal view is that the film portrays Uncle Remus as a hero and shows racially diverse children harmoniously playing and being friends, something that is present on any PBS childrens program but was very progressive at the time. In my opinion, the film is nowhere near as controversial as other films from the same era, including Gone With the Wind. As a film, Song of the South plays well, but is by no means perfect. The true highlight of the film are the animated sequences and the music. "Zip-A-Dee-Doo-Dah" won an Academy Award for best song and the score was nominated as well. Other memorable songs from the film include "How Do You Do?" and "Everybody's Got a Laughing Place." The live action portions are charming, mostly due to great performances by James Baskett, Bobby Driscoll, and Luana Patten. But as a story, Song of the South is fairly weak and at times it's hard to get emotionally invested in the characters. 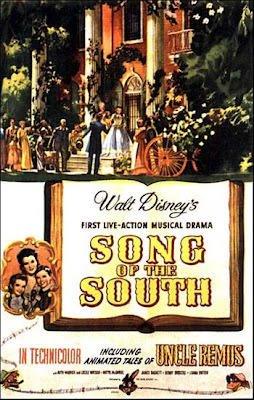 Although Disney has no plans to release Song of the South again, its story and characters still play an important role in the company. "Zip-A-Dee-Doo-Dah" is still one of the best known Disney songs and is routinely used in promotional campaigns. The characters are commonly found at Disney parks for pictures and autographs and the film served as the inspiration for one of Disney's most popular theme park attractions, Splash Mountain, which can be experienced at Disneyland, Walt Disney World, and Tokyo Disneyland. Disney has routinely played animated segments from the film on TV and even used it for one of their Sing-Along videos in the late 1980's, which was my first introduction to the music and characters. Song of the South was released on PAL VHS in parts of Europe and Laser Disc in parts of Asia. From these two sources, many bootlegs have been made. In fact, there are websites solely devoted to the duplication and sale of Song of the South on DVD. And while I don't condone the purchase of bootleg movies, Disney has left consumers no choice and created a black market for this film. But be warned that Disney has never released Song of the South on DVD in any part of the world, so any version of the film on DVD is unofficial and illegal.